Schematic of the synthetic pathway for GO-PEG aerogel (GPA). 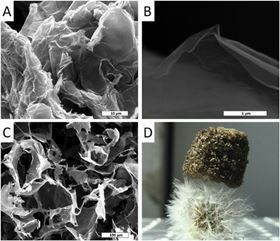 (A) SEM micrograph of as synthesized GO, (B and C): SEM micrographs of GO-PEG aerogel (GPA) at different magnifications, (D) photograph of a GPA monolith standing on Taraxacum officinalis. Researchers have created an ultra-lightweight material – known as an aerogel – from graphene oxide and a polymer that is fully biocompatible [R. Scaffaro et al., Composites Science & Technology 128 (2016) 193]. Porous materials like aerogels that are strong, flexible, and biocompatible are highly desirable as scaffolds for tissue engineering, drug delivery, and other applications. Aerogels can be produced from various different materials, including silica, carbon, and metal oxides, by extracting the liquid component from a gel form. 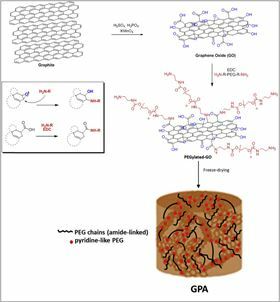 The team from the University of Palermo and Institute for Studies of Nanostructured Materials in Italy has used this approach to combine two-dimensional graphene oxide (GO) with the biopolymer polyethylene glycol (PEG) in a unique three-dimensional aerogel. The process starts with a highly oxygenated sample of GO, which is coupled to amino-terminated polyethylene-glycol (PEG-NH2) in an aqueous environment with a water-soluble carbodiimide. Covalent bonds form between the -NH2 and carboxyl groups of the GO to create a cross-linked hydrogel. After purification to remove unreacteded compounds and other impurities (using a dialysis process), the hydrogel can be simply transformed into an aerogel by freeze-drying. The result is a highly porous (99.7%), extremely light, and biocompatible material with outstanding mechanical properties. Most of the GO-PEG aerogel (or GPA) is empty space – consisting of a network of macropores 100-300 microns in diameter, with walls just 1-2 nm thick, interconnected by mesopores ranging in size from 2-60 nm. Moreover, initial biological tests with red blood cell membranes indicate that the new aerogel shows no discernible interaction, promising that the new aerogel can also be considered for biomedical applications. “The unique combination of outstanding mechanical properties, porosity and biocompatibility makes it useful for soft tissue engineering and drug delivery,” adds Maio. The researchers are now testing prototype GO-PEG devices for tissue engineering scaffolds and the preliminary results are promising, according to lead author Roberto Scaffaro. The new aerogel could overcome the twin challenges of mechanical robustness and adequate porosity to enable oxygen to reach growing tissue that plague scaffold materials. “More generally, our aim is to exploit the extreme versatility of this novel aerogel by exploring its possibilities for the other applications as well,” Maio told Materials Today. Cutting fuel cell costs with noble aerogels.